A great and fun way to house train your dog is to train her to communicate to you when she needs to go out to potty is by teaching her to ring a potty train bell. This is best taught after your dog seems to prefer to go outside to potty and you would like to give her a good way to communicate that to you. The dog bell works especially well for dogs who only have only a few accidents or have accidents by the door. 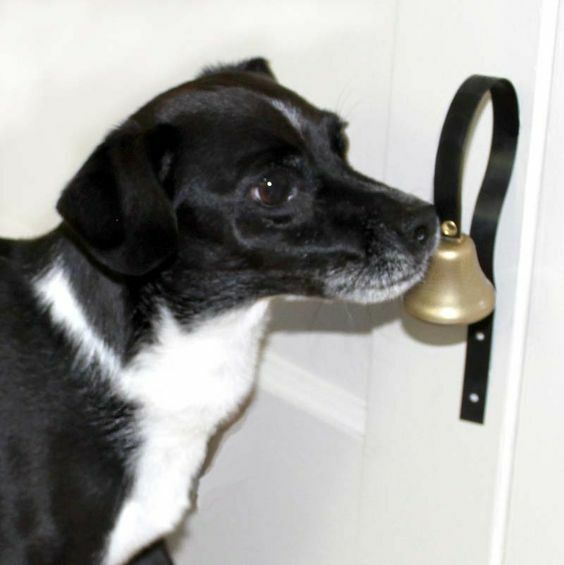 Teaching your dog to ring a bell prevents her from needing to resort to such "uncivilized" behavior as scratching on the door or barking to tell you to let her out. Intro to the bell: Show your dog the bell. If she touches it with her nose, give her a treat. Once she is touching her nose to the bell every time you show it to her, go on to the next step. Put the bell away when you are not practicing with it. Ringing the bell: Show her the bell and only feed her a treat when she rings the bell by touching it. Once she is ringing it every time you show it to her, go on to the next step. Put the bell away when you are not practicing with it. Ringing the bell by the door: Hang the bell by the door that you want your dog to use to go out and show her the bell. Give her a treat when she rings it. Once she is ringing the bell by the door each time you point to it, go on to the next step. Put the bell away when you are not practicing with it. Ringing the bell by the door to go out for a treat: Put your bell by the door. Let her watch you as you place a treat outside the door. Close the door and then point to the bell. When she rings the bell, open the door and let her get the treat. Once she rings the bell right away when you place a treat outside go on to the next step. Leave the bell in place by the door. Real life! : Next time you think she has to potty, go with her to the door and point to the bell. When she rings it, open the door and let her potty. Reward her with a treat when she finishes. Each time you let her out to potty, ask her to ring the bell first and feed her a treat when she finishes. I hope these instructions help you to train your dog to ring a bell to let you know when he or she needs to go out and speeds your house training efforts. If you liked this article, we would really appreciate it if you would consider becoming one of our customers or sharing this article with a friend! Thanks! Check out our housetraining aids! Our Bernese learned to ring the bell but then she did it just to go out and play. We had to put it away. My Labradoodle did that too. She was really good ringing the bell then going to the lawn to do her business. Then she started to ring the bell and walking away. Now she doesn't even ring it anymore and has accidents in the house. So frustrating. I did this with my toy American Eskimo and it really does work but now she is alittle older she rings it when she is bored and wants attention.